Shadows out of Time is a collection of three LP's with unreleased and formerly cassette-only material from Hunting Lodge, representing the first blush of their creativity, a time when each sonic experiment festered into a beautiful sore. Dark Ambient, Noise, Power Electronics, all represented here before these pigeons had holes in which to fit. One LP is comprised of the now-legendary EXHUMED, which was formerly released cassette-only, heard here in better shape than ever - direct-metal mastered from the original two-track mixes. The second LP is all unreleased material, highlights of which include never-heard gems from the recordings for the promotional cassette 23 MINUTES OF MURDER. On the flip-side, both literally and figuratively, are the electro-disco-teckno recordings used for intermission music at Hunting Lodge live shows in 1983. The final LP contains Live material which was formerly cassette-only, including tracks from AT THE HARRINGTON BALLROOM and S/M OPERATIONS LIVE, as well as much of the formerly unreleased LIVE AT THE LODGE. 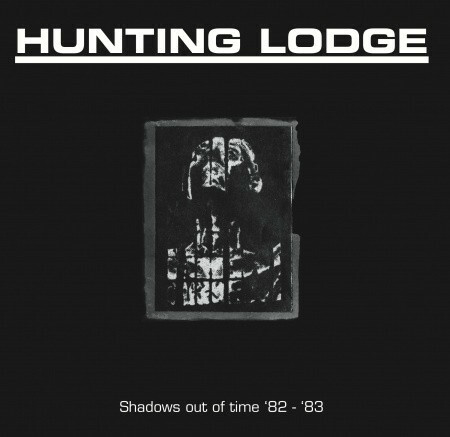 Oft-bootlegged, this performance is pressed here direct from the original masters, representing the two-piece early noise-unit of Hunting Lodge in harrowing live intensity. Furthermore featured in the Box-Set is an additional Bonus 7" including studio cover version of John Wright's „Stellazine Shuffle“ b/w „Learn to Will II“,formerly released on Nekrophile Rekords "Beast 666" cassette compilation in 1983 These LP's and 7“ are presented with period-accurate, gloriously bold, black and white artwork. Each LP comes in it's own printed sleeve inside of a box printed with the Thomas Nordstrom artwork previously only seen on early Hunting Lodge stationery. Also included are liner notes by Jeff "Central" Chenault and recording details, including information on equipment used, and never before seen photos of live Hunting Lodge and of collectors minutiae. The scars will never completely heal.